My baby girl is well on her way to her 1 yr. birthday. It has completely blindsided me! Gabe and I love watching her personality unfold. We call her a silent ninja...always climbing and crawling and attempting daring things without a peep escaping from her. Quite funny. She loves to chase after Gabriel and get into whatever he is playing. Luckily he has lots of patience for her. She is standing on her own but in no rush to walk. She is a speedster on the floor so she feels confident that it will be her means of transportation for a while....as well as mama's arms;) One of our favorite things is to watch Gabriel try to make her laugh. He loves being an entertainer, and she loves to be entertained, so its a great match. She laughs at him constantly. I can't seem to stop buying her little shoes (as you may have noticed on instagram). Also adding one too many bathing suits to her closet. Having a girl to dress up is way too much fun:) I hope and pray I can remember these sweet moments forever so I can tell her about them one day, and remind her how much joy she brings to our lives. I guess its time to plan a first birthday party! I remember everyone one of my three girls first birthdays! Have fun! What a sweet little face!! 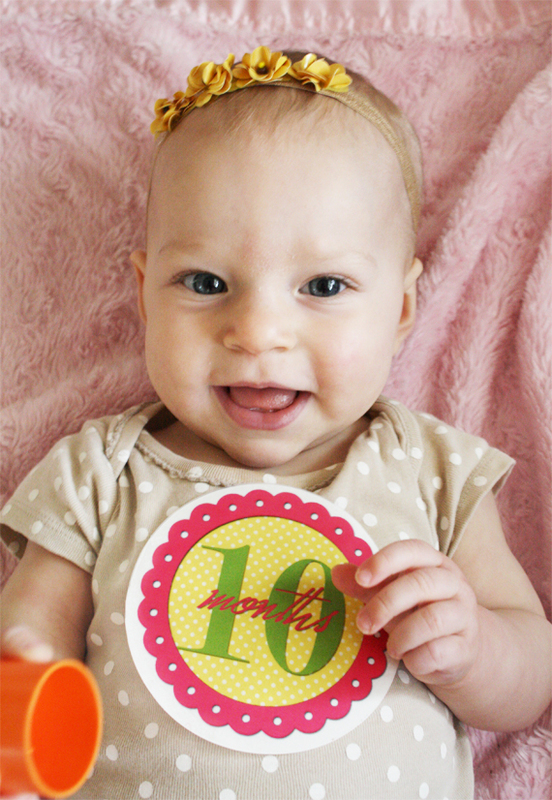 Love her headband :) Adorable! She's adorable! How wonderful for you! What a heartbreaker!! Too sweet! looking more and more like her beautiful mother!! Having a girl is so much fun...the dress up is amazing. Can I ask where you are buying your shoes for her? Trying to find some good ones for Mila (who hates things on her feet...but nevermind). She is beautiful and the headbands you make are cute too! how gorgeous is she! congratulations!!! Look at her little face! Can't believe it's been 10 months already!! She is getting SO big! I can't wait to see what you plan and do for her 1st birthday party! So fun! What a doll! It goes so fast doesn't it! Isn't it unbelievable how time flies!! My Matthew is going to be 2 next month!! CRAZY!!! PS: isn't she the cutest! She is seriously so cute! She looks just like you! So precious! What a little cutie pie - and budding fashionista with her stylin' headbands! Have fun with the 1st birthday party!! 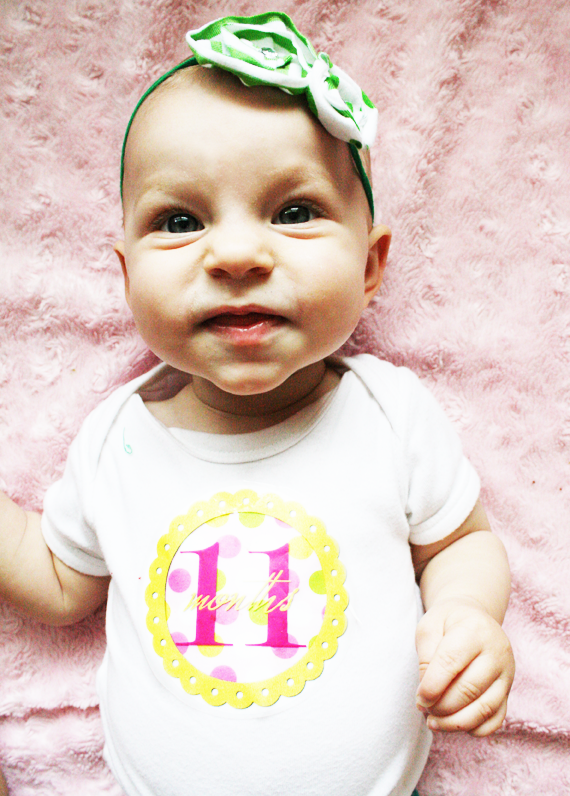 11 months?! WOW. seriously, where has the time gone? what a cutie, anna! love reading about your sweet family here on IHOD. She is soo precious!! Love the headbands! TOO CUTE! Happy early Birthday, little Veronica! I just want to her cuddle her all up! I can't believe it's been almost a year too! WOW! I can't believe it's almost been a year!! That's crazy. Time really flies. It's been so fun seeing her growth every month! She is a DOLL anna! It does seem that time flew by so fast! I remember reading her birth story and thinking how exciting it is for you to have a little girl. Now she's almost one?! She grows more beautiful each month!